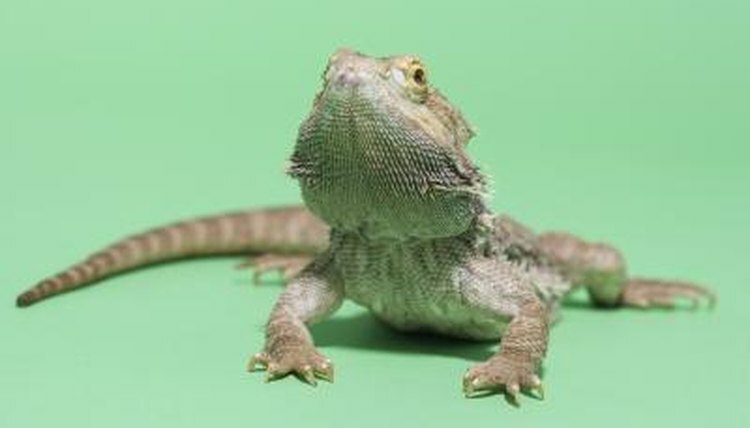 Bearded dragons are native to Australia. The lizards get their name from the pointed spines under their throats and around their ear openings, which resemble beards. When threatened they will hiss softly -- but other than this, they do not vocalize. Communication takes place through color displays, posturing and physical gestures. One of these gestures is arm-waving. Arm-waving is entertaining to watch, as it looks as if one bearded dragon is waving hello to another. The lizard stands tall on his back legs and one front leg, and waves the other arm slowly in a circular fashion. The motion is like the butterfly stroke in swimming but is done at a slow pace. It can last for several moments. The gesture is normally a sign of submission, not greeting. Arm-waving is seen frequently in juvenile dragons. Youngsters use arm-waving when interacting with each other, even where there is no apparent aggression. They will slowly move one arm in a circular motion and may even switch arms and body position while doing this. It is more frequent with those who are smaller and may be the start of territorial behavior. Juveniles will arm-wave to show submission to an older dragon, particular after the adult head-bobs to indicate dominance. Bearded dragons have social hierarchy. Highest-ranking creatures take the best basking spots. If a lower-ranked male tries to challenge a dominant male, the dominant one will quickly bob his head as a sign of superiority. If the challenger waves an arm to signal submission, he will be left alone, but if he does not, then a fight can start. Low-ranking males clearly use arm-waving to avoid aggression. Males wave only to indicate submission to a dominant male, but a female will arm-wave to show she is ready to mate. Arm-waving to show receptiveness to mating is usually accompanied by slow head-bobbing. Breeding behavior can also include circling around each other and tail-twitching.